← Does the United States Deserve God’s Blessings? This is an excerpt from LBJ’s now infamous, “I will not run” speech. It’s message is poignant today. In my 65 plus years on this planet, I have never seen our country so divided so completely torn asunder, as I have in these last few months of the current presidency. Rather than trying to unite a divided country, Mr. Trump seems Hell-bent on destroying any modicum of reconciliation or unity. We have become a nation focused on differences. What divides us. Not what unites us. We have always been a nation of independence. Now we are a nation that has become increasingly and alarmingly, isolationist. Mr. Trump singlehandedly, is the “Divider-in-Chief” as the Washington Post so aptly reminds us. Tennessee Republican Senator Bob Corker said: “It’s a shame the White House has become an adult day care center. Someone obviously missed their shift this morning.” Yet the Whitehouse staff remained inquisitively silent. The silence deafens the ears with a resounding crescendo. Yet its absence gives pulse to introspection. Introspection that causes sickness, and a disquieting of the soul. I have stared into the face of dementia. I know what it looks like. I know what it does. How it robs. How it descends into crazy ramblings. Finally a silence as the voice and power to speak are taken. Nancy Reagan pegged it as “The long goodbye.” It was heart-wrenching as my father went through this process. It is NOT an evil to be wished upon anyone. It was a time for my family to come together, and honour the man whose hands ensured there was a roof over our head, and food on the table. It was a time to unite. Not shun. This is the greatest fallacy of America. We are distrustful, divisive, and dismissive of those that are different. Subjects become objects. Racism 101. Instead of welcoming dissent, some want to quash it. NOW! I can no longer remain silent. I have seen the descent of dementia. I recognize those symptoms in Donald J. Trump. This is a clarion call to the members of the current administration’s cabinet, and members of our Congress, to remove Mr. Trump from office. If you refuse to act, this nation will become severely isolationist. Severely divided. Severely dismissive. When is the right time to have this conversation? We must move forward as a nation. That means removing the cloud of suspicion and allegations, and bring respect back to the Whitehouse. That gentlemen…is your domain. You must swallow hard, and remove the current President, through either the impeachment process, or invocation of the 25th Amendment. And here’s the rub. The dichotomy in my mind. This is the greatest challenge that I face as a Christian at the moment. I have taken time away from Social Media (the other admins on Christian Goths on Facebook have given me time) to reflect on where we are as a nation. I feel like we are being herded like cattle into a bitter, and vitriolic division of social class order. I feel that Trump’s continued actions are tearing this nation apart, rather than providing a balm and time to heal. How do I pray for a person, I have no respect for? Who daily seems to put his foot in his mouth, or worse. 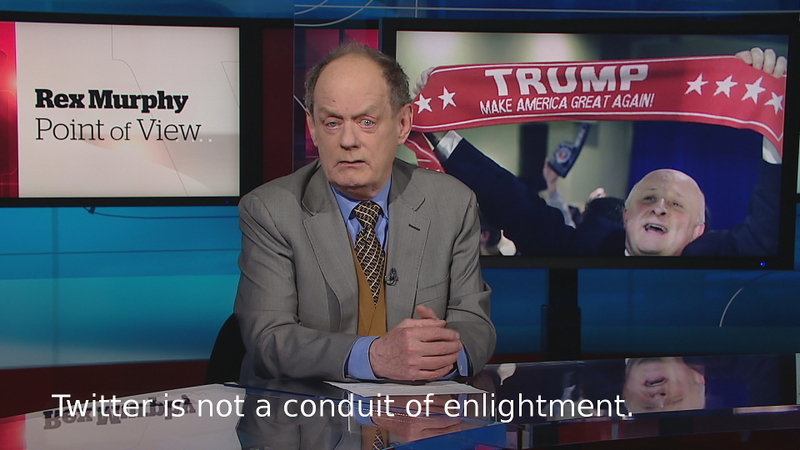 Rex Murphy was absolutely correct: Twitter is NOT a conduit of enlightenment. I find it increasingly difficult to pray for Mr. Trump. You are my Pastor, what do I do? I’ll bet I am not the only person who feels this way. I need to focus on the 500th anniversary of the reformation. My article on Sola Sciptura does not flow correctly. The information is all there, but it is not cohesive or tight. Pray God would change me heart. That I need to pray, even though I may not respect this person. I can respect my enemies. But when Trump is mocked in the news media…sometimes to be honest…he inflicts wounds upon himself by simply opening his mouth. Maybe that is my prayer today. I too am appalled and horrified at the behavior of our president. I am ashamed for our country. We must pray that God in His wisdom will remedy the situation.